Verderflex Dura 5 & 7 peristaltic pumps now boast higher dosing/transfer rates. Wilden continues rollout of AODD website. 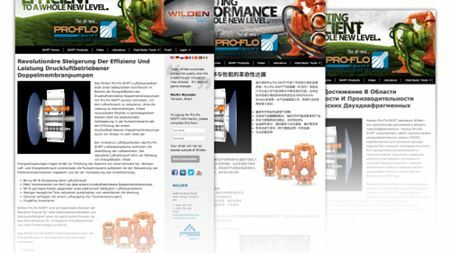 Multilingual Pro-Flo SHIFT website offers collateral in seven languages to support localized sales and service of new AODD pump technology. ITT will be showcasing its latest technologies for the offshore oil and gas Industry at the annual Offshore Technology Conference, May 5-8 in Houston. The Sulzer board of directors has appointed César Montenegro as the new president of the company's Pumps Equipment division. Kirloskar Brothers Ltd (KBL) has set up a 10 000 sq m facility in Cairo, Egypt through its subsidiary SPP Pumps MENA LLC. Macedonia’s MZT Pumpi has manufactured and installed new pump aggregates for the Al Qaim cement plant in Iraq. Wilo will have a significant presence at IFAT this year - the main European exhibition for water, sewage, waste and raw materials management. Watson-Marlow Pumps Group has opened a new US sales office in Lake Forest, California. Aspen Pumps achieves a second Queen's Award after receiving one five years ago. Ashton Seals completes a successful week at the Fluid Power & Systems Exhibition at the NEC, Birmingham UK. New AOD pump designed for applications having high humidity or potentially explosive atmospheres. Hayward Tyler has been named as one of 50 conditional recipients of the UK government’s £300 million Regional Growth Fund Round 5. KSB is supplying four new-generation boiler recirculation pumps for two new Chinese power stations in Laiwu and Taizhou. Verder has introduced a hygienic double diaphragm pump series to complete its existing series of Verderair VA and Pure diaphragm pumps. Verder International has opened an office in Pune, India. The fluid technology specialist Bürkert has provided a fluid control system for the fuel cell stack of the hydrogen electric race car 'Forze VI'. The following stories were the most popular with visitors to the World Pumps website last week. Kirloskar Brothers Ltd’s all-women Coimbatore plant has been recognised by India’s Limca Book of Records for its Mahila Mission 20 project. Dieter Sauer is joining Grundfos as president and general manager of its Aurora, Illinois, USA-headquartered Water Utility business. WEG exhibit's world’s most energy efficient range of low voltage motors. At the Drives and Controls 2014, WEG will be launched and showcased a broad range of motors and drives. UK-based AESSEAL presents EasyClean for the food, beverage and pharmaceutical industries. The pump is an agitator version of the company’s most popular cast iron pump from its KTZ series and will be available to the European market in August. Flowserve Corp has secured multiple orders to supply key pumping systems for the Lichterfelde Cogeneration Power Plant in Germany. KSB Aktiengesellschaft's selection program to enable simple hydraulic selection of pumps and valves for fluid circuits in building services systems. Cat Pumps has introduced a new positive displacement triplex plunger pump to meet the demands of Very High Pressure (VHP) systems. Programme promises to make renewable heating more affordable for millions of homeowners in the UK. Company honoured by pump industry for outstanding environmental contribution. Show will take place in Ankara, Turkey, in a year's time. Italian pump specialist has grown into an international group. Eaton will be showcasing its SmartWire-DT technology at the Pump Centre Conference and Exhibition in Telford UK on 30 April. Long-established British company CDR Pumps also announces training courses in June. KSB will showcase a new package pressure booster system at the IFH trade fair in Nürnberg in April. Sulzer has delivered aeration, mixing and pumping equipment to a new wastewater plant in Campos do Jordão, Brazil. SPP Pumps is named 'Manufacturer of the Year' at the 2014 Pump Industry Awards in Warwick, UK on 27 March. ABB wins Supplier of the Year for the fourth time at 2014 Pump Industry Awards. Schaeffler launches its multi-point lubricator for rolling bearings to provide four different lubrication volumes for bearings with varying requirements. India’s CRI Pumps Pvt Ltd has acquired Italian pump manufacturer Fabbrica Italiana Pompe Sommergibili Srl (FIPS). Get ready for 2015’s Energy Efficiency Directive mandates with June residential event. The Weir Group plc has confirmed that it has made an indicative all share merger proposal to the Finnish engineering group Metso Corp. The following business stories were the most popular with visitors to the World Pumps website during March 2014. Schroeder Valves is celebrating 125 years of business this year. Waukesha Bearings has launched its multi-lobe semi-floating (MLSF) bearings.